Patio doors add beauty and functionality to your home. They make your transition from your home’s interior to the outdoors and vice versa smooth. Another reason to invest in patio doors in St. Louis, MO, is to save more energy. We offer multi-paneled St. Louis French doors that come with High-Performance™ Low-E4® SmartSun™ glass that will lessen the amount of heat buildup in your home. This will keep you from using your HVAC units, which can drive up your energy consumption. It is 47% more energy-efficient in winter and 70% more efficient in summer, making it our most energy-efficient option. It has our highest rating in cool weather and offers exceptional performance in areas with hot climates. This is significant as solar heat gain can lead to overreliance on your HVAC systems. Our patio doors are made of wood and covered with fiberglass, aluminum, or vinyl. These materials offer superior insulation. This will ensure you a cozier atmosphere, lessening your reliance on your air-conditioning units for more energy savings. We have years of experience that will help us ensure a successful and airtight installation of your sliding patio doors in St. Louis. In fact, part of our installation process includes applying insulating foam in between the gaps of your home’s old door frame and new door. We will also ensure that your doors’ seals and weatherstripping are in top shape to keep the elements out. Aside from the energy-saving features of our patio doors, they offer low-maintenance qualities for long-lasting performance. The coating of our patio doors are resistant to fading, blistering, and peeling, lessening the need to keep them in top form. Additionally, our doors come in a wide range of design options that will let you customize them for enhanced curb appeal. Lastly, they come with exclusive and reliable warranties for your peace of mind. 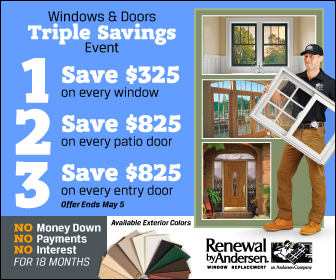 Enjoy more energy savings and install quality patio doors from Renewal by Andersen of St. Louis. Call us today at (314) 332-2364 for a FREE, in-home consultation.